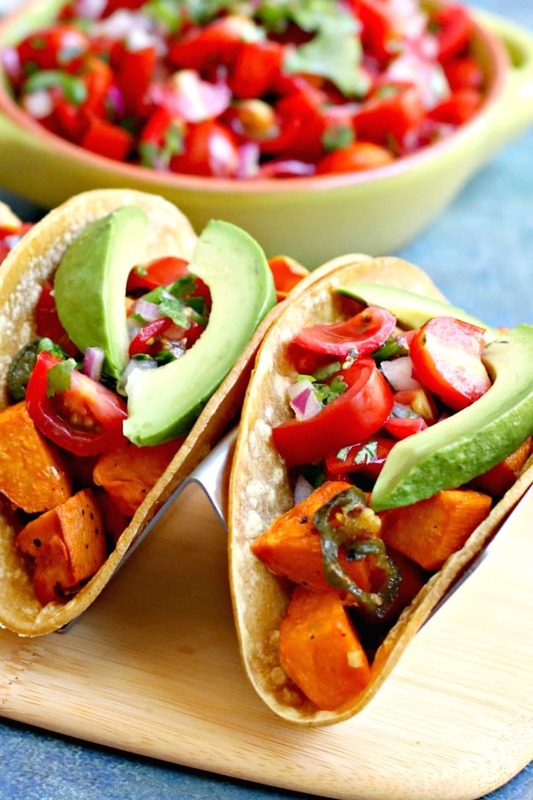 Roasted Sweet Potato Tacos are flavorful and easy to make in about 30 minutes. Topped with fresh pico de gallo and avocado slices, these naturally vegan and gluten-free tacos are sure to become a family favorite. Tacos are a weekly staple in my house. You can add just about any vegetable, bean or grain to a tortilla and come up with a tasty meal. And while I often make Potato and Kale Tacos and Soyrizo Potato Tacos, I recently realized that I hadn’t shared my recipe for Roasted Sweet Potato Tacos with you. This recipe was inspired by a meal kit I received from Terra’s Kitchen to review. They sent over a refrigerated case filled with pre-made pico de gallo, diced sweet potatoes, corn tortillas, and an avocado. And while I enjoyed the combination, the fresh salsa had very little flavor since it was made with unripe tomatoes. Plus I knew I could make even better tacos for much less money in the same amount of time. And now I’m excited to share my recipe with you! 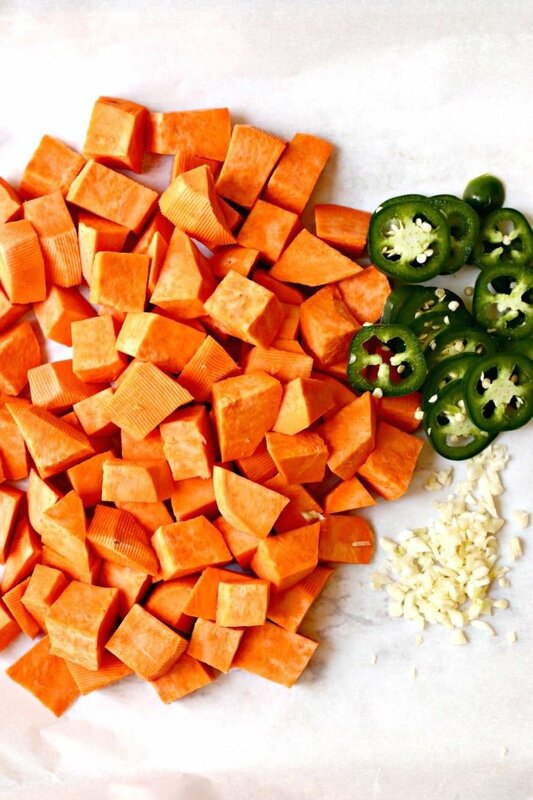 The first step in making Roasted Sweet Potato Tacos is to prepare the sweet potatoes for the oven. This only takes a few minutes. I’m not a fan of the skin on sweet potatoes, so I like to peel them. Then I cut them in cubes or large chunks. I also finely chop a few cloves of garlic and thinly slice a fresh jalapeno pepper. I like to line my baking sheet with parchment paper for easier clean up. Or if you have a Silpat, that’s even better. I arrange the vegetables on the lined baking sheet, then drizzle over the olive oil, salt, and pepper. Then I toss everything together using my hands. Be sure to wash them after this. The last thing you want is to rub your eyes after handling jalapenos! After 15 minutes in the oven, I give the vegetables a quick stir. And after 25 or 30 minutes, they’re done! While the sweet potatoes are in the oven, it’s time to prepare the quick pico de gallo that will top to Roasted Sweet Potato Tacos. 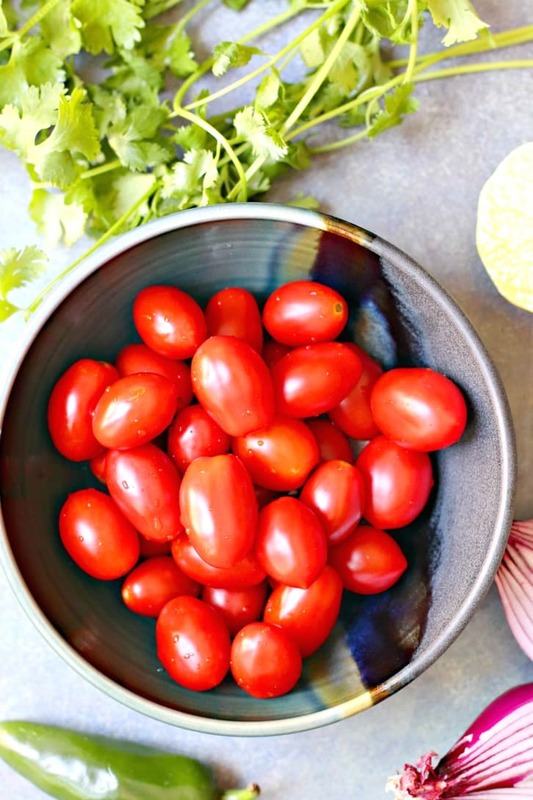 I love this fresh salsa because you only need a few ingredients to make it, and it’s really flavorful. I also use it when I make Quinoa Burrito Bowls. What’s nice about this version, is it uses cherry or grape tomatoes, which are easy to find all year long. And unlike some other varieties of tomatoes, they tend to be sweet whenever you purchase them. 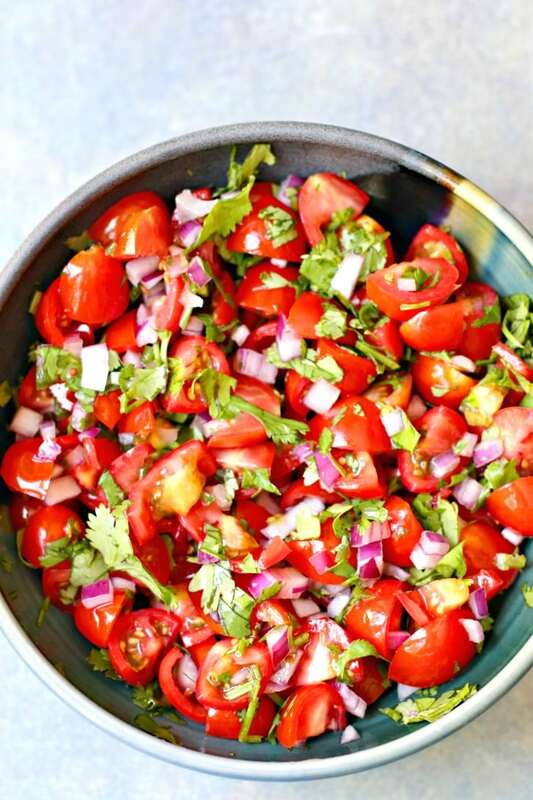 Simply quarter the little tomatoes and combine them with minced jalapeno, diced red onion, chopped cilantro, lime juice, and salt. And you may want to make a double batch and enjoy the extra with tortilla chips or other Mexican favorites. I’ve also been known to eat it like a salad. Once the ingredients are mixed, you can set aside the pico de gallo. Then while the sweet potatoes are finishing up in the oven, I warm up the corn torillas and slice the avocado. For the tortillas, my favorite method is to heat them individually on the stove and keep them warm in my insulated Tortilla Warmer until it’s time to eat. And then it’s time to build the Roasted Sweet Potato Tacos! 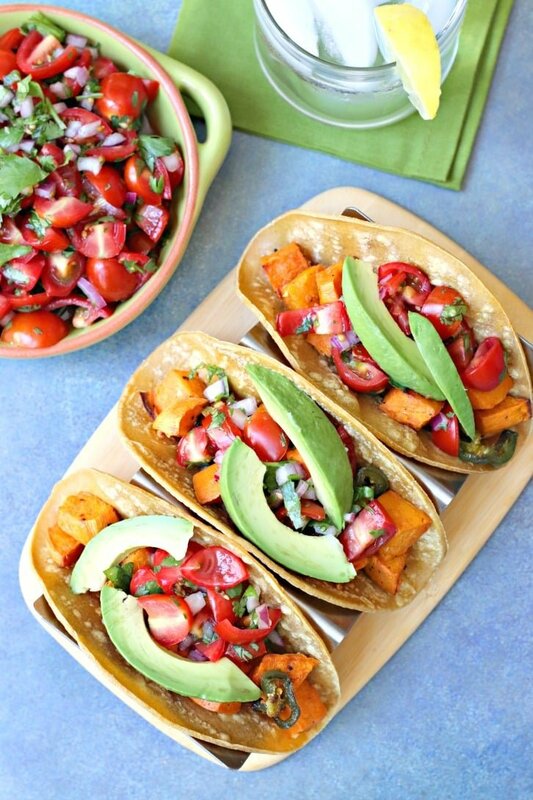 Take a tortilla, add some of the sweet potatoes, then top with pico de gallo and avocado. And even though both the sweet potatoes and salsa contain jalapeno, the heat level is very mild. Yet the combination of ingredients is fresh and flavorful. You can also add your own twist to your tacos by adding black beans or other roasted vegetables such as corn, onions, and bell peppers. 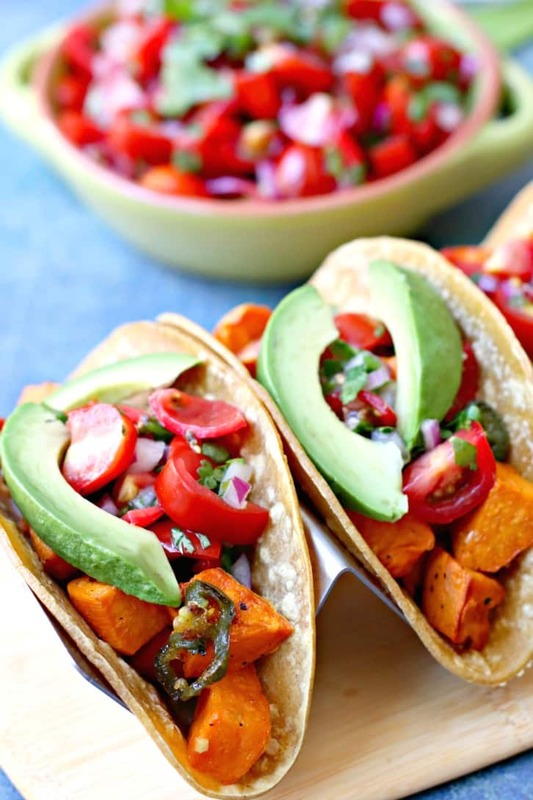 What are your favorite vegan taco fillings? 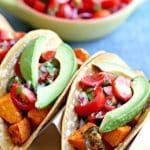 Now let’s make Roasted Sweet Potato Tacos! 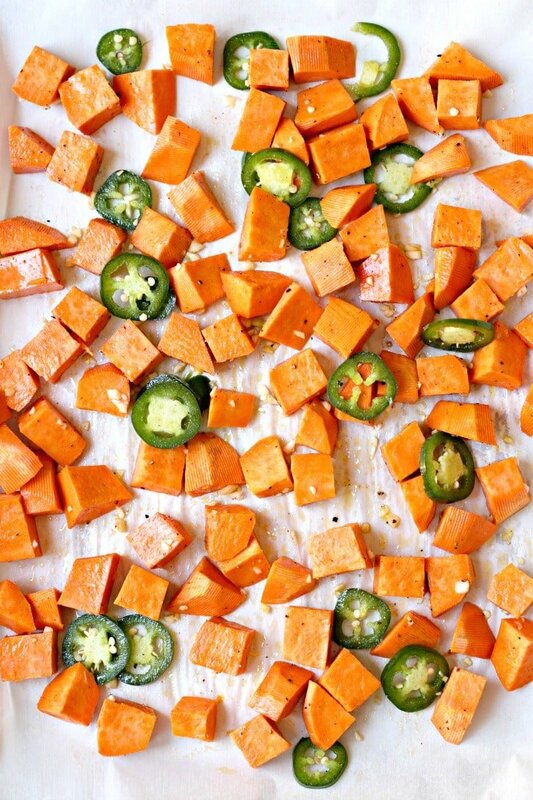 Arrange the sweet potato cubes, garlic, and jalapeno slices on a baking sheet lined with parchment paper. 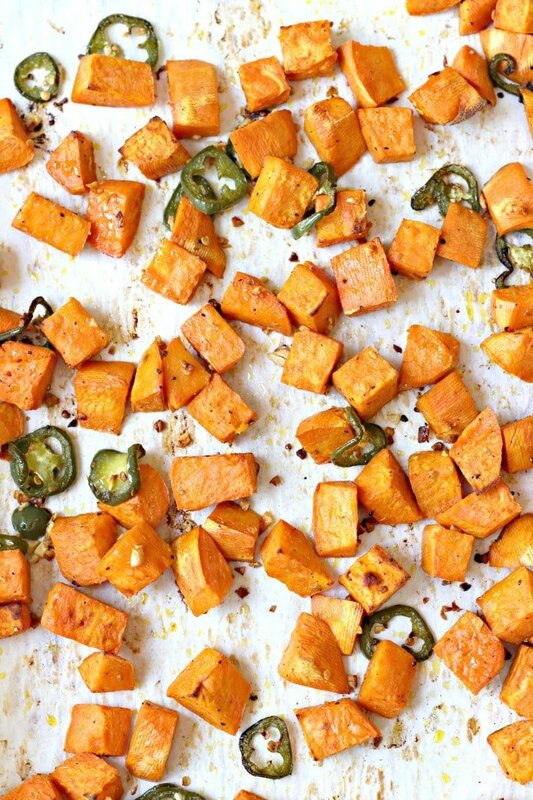 Drizzle the olive oil and salt and pepper over the sweet potatoes. Use your hands to toss to coat. Bake in the oven for 25-30 minutes until the sweet potatoes are tender and lightly browned, stirring after 15 minutes. 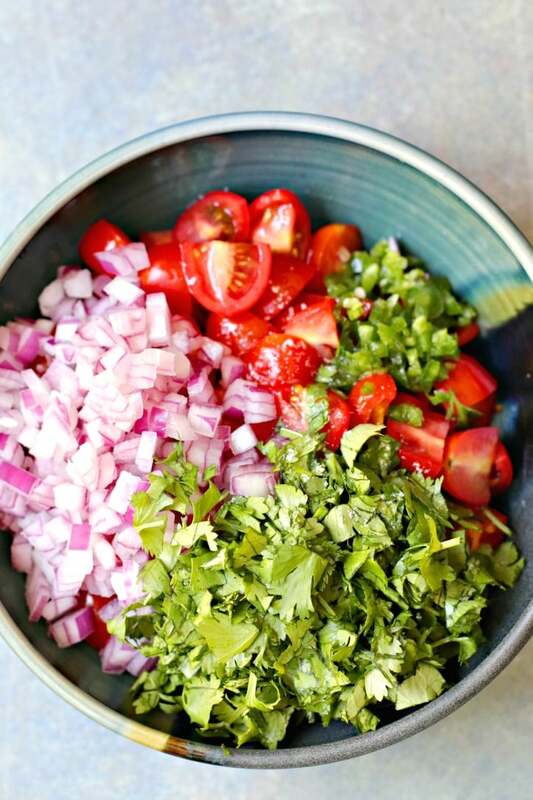 Meanwhile, prepare the pico de gallo by adding the ingredients to a medium bowl. Gently mix everything together. Taste and add salt as needed. 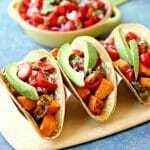 To make the tacos, fill the warm tortillas with the roasted sweet potatoes, then top with pico de gallo and avocado slices. Enjoy! Only a few ingredients, but SO MUCH flavor!!! We left off the jalapeno to make it kid-friendly but it still wowed us parents 🙂 We plan to add this to our rotation!